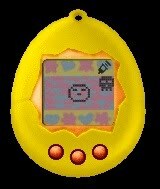 Anybody remember Tamagotchi? I found a Tamagotchi emulator (thanks unclechicken) and I've been playing around with it today...it's pretty silly. It looks neat though and has a bunch of different skins, but it seems to run a little fast maybe. I think the modern version of Tamagotchi is a smartphone that you "have" to check every couple of minutes to read your email. I didn't know that when Tamagotchi evolves or grows up or whatever that there are different characters you can get. One of them is Bill Clinton? !